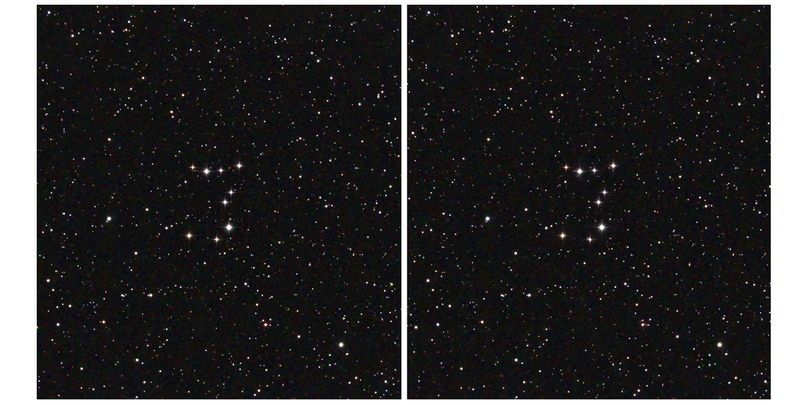 Roaming around a planetarium program, I came across a clear 3 asterism and was able to photograph it in late April from the New Forest Observatory. In the image above, processed by Noel Carboni, you’ll notice that the 3 really stands out quite nicely. In the constellation of Leo, it’s well placed for stargazers at the moment by being high in the sky not long after sunset for observers in the Northern Hemisphere. The central star of the 3 is SAO 98678 at magnitude 8.65, so it’s not naked eye. It’s surprising that these fortuitous asterisms are pretty rare. You may want to scroll around a planetarium program to see if you can find any. While we’re on 3, click on the image above to see Brian May’s 3-D view of this asterism. We’re not actually able to have a real baseline wide enough to create a 3-D image in the conventional way, so this is a bit fantasized. Note that 3’s stars were intentionally made to stand out from the background, and some of the brighter stars have been brought forward by varying amounts. If numbers were lonely, it’s been sung that 1 should be the loneliest number of all (oddly it was sung by a group having 3 as part of its name). Though 3 is supposed to be a crowd, this 3 is out there all by its lonesome. Perhaps it’s trying to tell us something. After all, the Sun is about 2/3 of the way out from the center of the Milky Way; the Earth is the 3rd planet from the Sun; and we’re living in the 3rd millennium of a 3 dimensional world. Maybe 3 is the new 1.